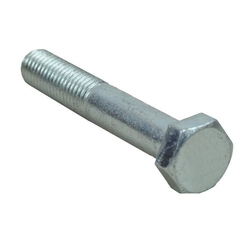 Stainless Steel And HEX HEAD BOLT, Size: IN MM : M3 TO M20 IN INCH : 1/8" TO 3/4"
Size: IN MM : M3 TO M20 IN INCH : 1/8" TO 3/4"
Being a leading enterprise of this industry, we are offering a huge range of Fully Threaded MS Hex Bolts. - M16 to M 100 and Maximum length up to 1200 mm. We provide an extensive range of Hex Head bolts, which is available in the various shapes, sizes and finishes. These are manufactured using top quality raw material and are known for their excellent strength and wear & tear resistance. Our range of product is widely used in fastening the parts of machines and structures. - Head Forged ( Hot Forged ), have better grain flow makes product more stronger. - Thread - Rolled threads, Uniform Contour, Perfect root radius run out, imparts high fatigue strength. 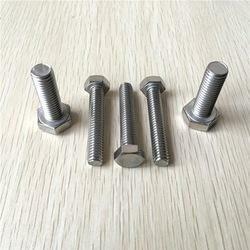 Manufacturing and supplying of haxagon head bolt. Standards :DIN 931 - ISO 4014 - UNI 5737.